A candidate must have or be completing an undergraduate degree in Biology, Chemistry and/or Physics equivalent to the corresponding major(s) at Truman. A candidate’s certification GPA must be at least a 3.0. This should include coursework in all three sciences listed above as well as Earth/Space Sciences and Environmental Science/Ecology. Candidates must have significant, pre-professional teaching experiences including some of the following: tutoring, grading, substitute teaching, attending professional conferences, and/or working with adolescents in sponsored programs. A candidate’s personal statement must include a discussion of the required experiences. Candidates seeking to complete a full-year internship should have most of the above experiences and must have substitute teaching experience. At least one of the candidate’s letters of recommendation must address the candidate’s potential to succeed in graduate-level science classes. At least one letter of recommendation must discuss the candidate’s suitability to work with secondary-level school children. Candidates must demonstrate the knowledge, skills, and disposition for teaching and may be interviewed. Please see your Education advisor each semester to ensure smooth processing through the program. Students being certified to teach in Missouri must have a 2.75 or higher GPA overall, a 3.0 GPA or higher in their content area, and a 3.0 GPA or higher in professional classes (mostly education classes). 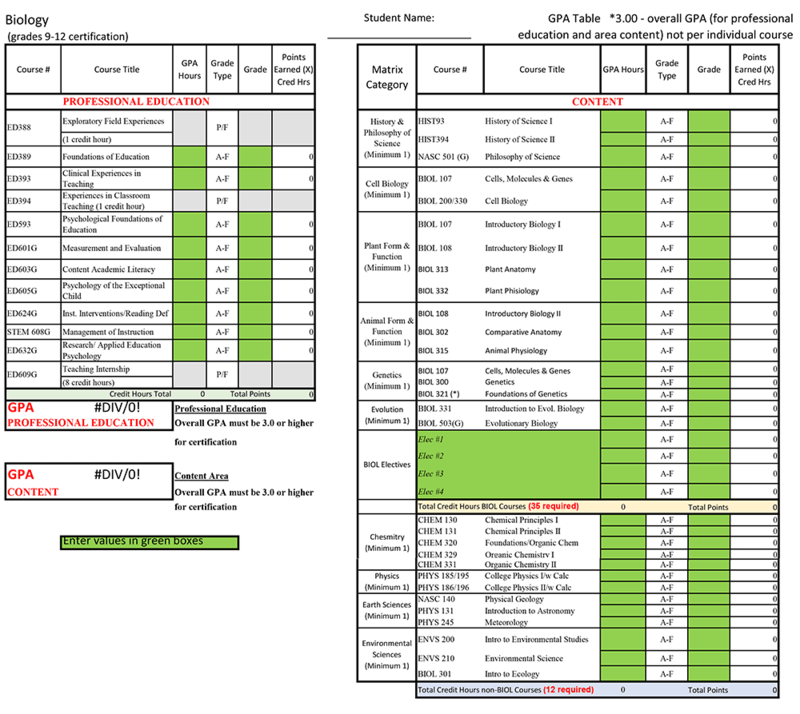 This GPA sheet was crafted to help students keep track of these three GPA calculations, as well as to aid with advisement and enrollment. If students have any questions about their GPA, they should meet with their specialty area advisor.